Don't Let the Real Test Be Your First Test!Prepare for CompTIA Security+ Exam SY0-401 with McGraw-Hill Professional--a Platinum-Level CompTIA Authorized Partner offering Authorized CompTIA Approved Quality Content to give you the competitive edge on exam day. 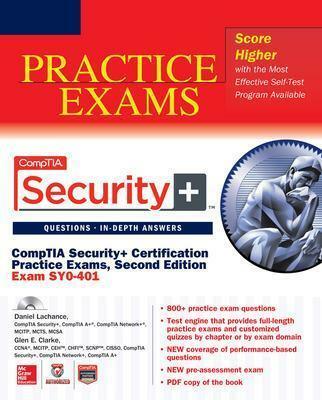 CompTIA Security+ Certification Practice Exams,Second Edition (Exam SY0-401) is filled with more than 800 realistic practice questions--including new performance-based questions--to prepare you for this challenging exam. To help you understand the material, in-depth explanations of both the correct and incorrect answers are included for every question. This practical guide covers all official objectives for Exam SY0-401 and is the perfect companion toCompTIA Security+ Certification Study Guide,Second Edition.